A huge gilded cage, located at the southeast entrance of the Central Park, has become New York City’s new landmark – and attracted visitors from across the world. Visible from the Trump Tower just one block away, where President Trump’s famous gold-rimmed penthouse apartment is, the artwork was given a golden hue, either to please or to mock Trump, depending on your point of view. 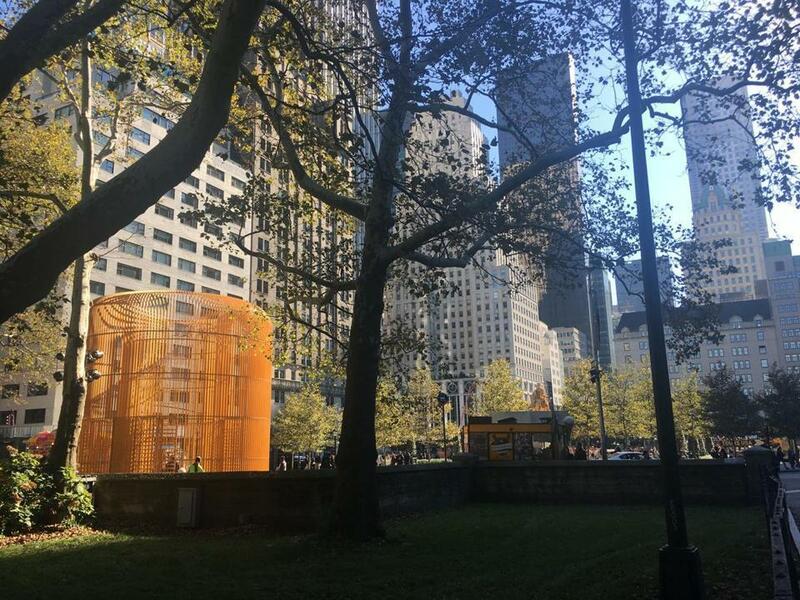 As I walked by the public artwork on a recent trip to Manhattan, the buzz was evident: A Chinese visitor offered to take a photo of me standing near the golden cage. But as a native of Guangzhou, I couldn’t help but notice the irony: that while Ai Weiwei is widely celebrated throughout the world, his name has been taboo in his own country because of his criticism of the ruling Communist Party over human rights conditions. Unfortunately, the younger generation growing up behind the Internet’s Great Fire Wall has no idea who Ai Weiwei is. In 2014, media censors had to rush to delete a video from a website after the state broadcaster CCTV accidentally aired a scene featuring him talking about youth-related issues – the young director of the program apparently did not recognize the prominent dissident and took him as an ordinary middle-aged interviewee. The acclaimed artist has made a documentary that bears witness to a global tragedy. But some of his fellow exiled Chinese dissidents are upset about Ai’s new focus. “What has Ai done for his own people with his fame?” one social media post asks. The argument goes something like this: He has given up fighting for human rights in China and his attention now is focused on remote places unrelated to his own people. They think he has chosen a safer battlefield, making him a coward and hypocrite. Such criticism is not really fair, though hardly surprising. Ai has long been among the very few Chinese celebrities who are not only pro-democracy but also share values with those on the left of the American political spectrum. As much as he is critical of the Chinese authorities, Ai has always been active in the antiwar movement in the West. At the beginning of “The Human Flow,” the narrator doesn’t flinch from the role the US-led invasion played in death and displacement in Iraq, noting that 268,000 peole have been killed there since 2003 and more than 4 million Iraqis have been forced from their homes. Yet a basic tension colors public opinion of his work in China. After 68 years of strict ideological control, binary thinking has become so pervasive that, to many, if someone is not a friend, the person must be an enemy. And cut-throat competition, in a country that has moved from its poverty-stricken past to prevailing consumerism and pragmatism today, has led many to subscribe to the notion that life is a zero-sum game and that China does not need to share responsibility for refugee resettlement. Social media platforms are littered with attacks on those deemed soft on refugees, including German Chancellor Angela Merkel. In June this year, Chinese actress Yao Chen, the first goodwill ambassador from China for UNHCR, the UN refugee agency, shared her experience visiting shelters, hoping to raise awareness. That resulted in strong backlash. Underlying the negative reactions are antagonism toward so-called political and moral correctness, rising nationalistic sentiments, and the feeling of being victimized by an unfair society with scarce resources. But Ai Weiwei is unique. In 1958, then just a year old, he was exiled with his family to northwest China’s Xinjiang region after his father, a renowned poet, was branded an enemy of the state. And half a century later, Ai himself went through house arrest and harsh treatment. When he finally got his freedom back, he moved to Berlin, to continue his artwork. As a refugee in exile for decades himself, Ai demonstrates great empathy toward the displaced. Ai Weiwei is not an enemy of the state. He is an enemy of walls, physical or virtual, no matter who builds them, Trump or Xi Jinping. Audrey Jiajia Li is the 2017 Elizabeth Neuffer fellow with the International Women’s Media Foundation (IWMF). She currently is in residence at the MIT Center for International Studies.